The World Health Organization (WHO) has said that an independent laboratory test has confirmed a case of Sars in southern China's Guangdong province. Earlier, the Chinese health ministry issued its own diagnosis of Sars in the case of a 32-year-old man in hospital in the city of Guangzhou. It is China's first confirmed case of the illness in six months. Twenty five people who had contact with the patient have been isolated, but none appears to be infected. The Chinese authorities have also announced that they plan to slaughter thousands of civets - small cat-like animals - amid the growing fears surrounding the re-emergence of the deadly Sars virus. In Guangdong, where civet is a popular dish, wild animal markets will close. Researchers in Hong Kong have linked the strain the man is carrying and a similar virus found in civets in China. Sars killed 349 people on China's mainland last year. "At least one of the tests has come back saying this is indeed the SARS virus. The confirmation has come back," a WHO spokesman told the AFP news agency. Earlier Zhong Nanshan, director of the Guangzhou Institute of Respiratory Diseases, told a Hong Kong news conference that the 32-year-old television producer, who was ill in Guangdong, definitely had the Sars virus. Mr Zhong's team said that the virus in this latest case appeared to be slightly different to that which originated in Guangdong in November 2002 and eventually fuelled a worldwide outbreak. 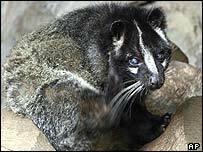 The researchers added that they had found a virus very similar to this new strain in civet cats, suggesting it had jumped from the animals to humans. Mr Zhong said the suspected Sars carrier had claimed not to have eaten any wild animals before he fell ill, but did admit to touching at least one rat. Many researchers believe the strain of Sars which killed hundreds of people last year could have jumped species to humans from an animal like the civet. Guangdong Health Bureau official, Feng Liuxiang, said up to 10,000 civets would be slaughtered. "We will seek to seal and block all civet cats from other provinces and take action to kill civet cats in Guangdong province," he told a news conference. But the WHO cautioned against a potentially negative fall-out from a hasty slaughter. Roy Wadia, the WHO's Beijing spokesman, said the Chinese authorities should be careful not to drive the civet trade underground, which could be "counter-productive to containing the disease". He also warned against a messy cull which could risk a renewed outbreak of the virus. "What we are suggesting is that the slaughter be very carefully done," Mr Wadia said. There are also fears of a resurgence of Sars in Hong Kong and the Philippines. A Filipino maid, who has recently returned from working in Hong Kong, and her family, are being tested for possible cases. The woman, who has a fever, is currently isolated at a hospital along with her doctor, a health department spokesman Dennis Magat said. The authorities are trying to trace people she may have had contact with. The Philippine government last year reported 14 Sars cases, which included two deaths from the disease. 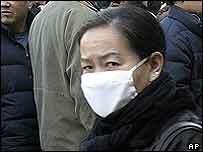 Sars killed 774 people worldwide, mostly in China, Hong Kong, Taiwan and Singapore. "So far there's been no repeat of last year's panic"